Friday 24 October I had a 21:55 flight from Heathrow T5. I met Cathy in the business lounge for dinner before the flight. Our taxi driver in Mumbai threw our suitcases onto a tiny roof-rack and made a half-hearted attempt at securing them with a short piece of rope. As we neared our hotel it began to rain and Cathy became concerned that her fabric suitcase would be getting wet... however, during our taxi ride from Mumbai to Pune we'd realise what we should actually be worried about! On the express way just outside Mumbai we spotted a piece of maroon hand luggage lying on the carriageway. There was a car parked at the side of the road but we soon realised it wasn't their bag. About 10 minutes later we caught up with another taxi with the same tiny roof-rack holding 2 suitcases in an identical maroon finish. They would NOT be happy when they arrived at their destination! 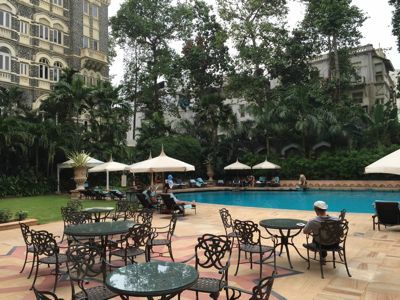 We stayed at the Taj Mahal Palace hotel opposite the Gateway to India. 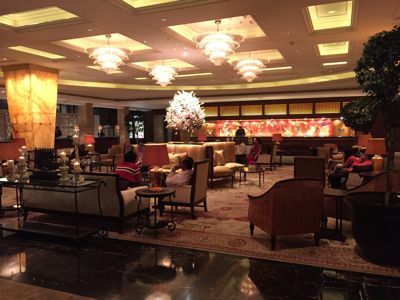 The lobby of the Taj was lovely. It was nice to be sat down with a cold drink while we were checked in. 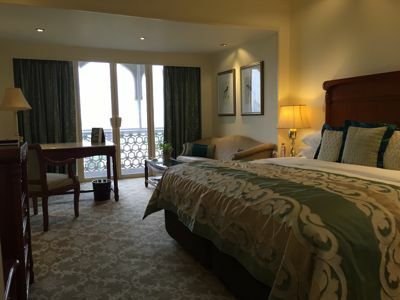 Although we were staying in the 'Taj tower', rather than the main building, it was still very nice. That afternoon Cathy and I went for a walk. We started out heading south-west along the coast from the hotel then headed north, walking past the Prince of Wales Museum, the Institute of Science and out to the sea wall of Marine Drive. Sunday 26th I managed to get myself out of bed early and walked out to the sea wall around Back Bay. 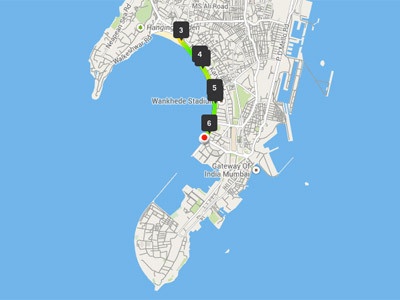 I ran 6km along the Marine Drive jogging track. At the northernmost point on the run I reached a beach where I could see a large number of people sleeping rough. 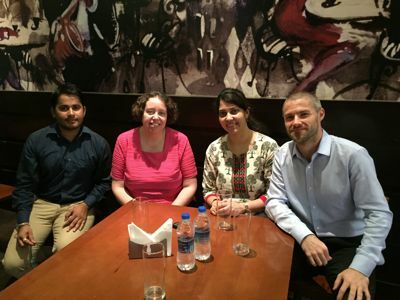 This was Cathy's first time in India so I thought it would be a good idea to arrange a guided tour of Mumbai. I asked Mala Bangera to be our guide as I had really enjoyed the tour she gave me the year before. 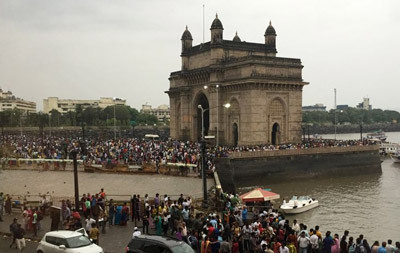 Our first stop on the tour was the Gateway to India. 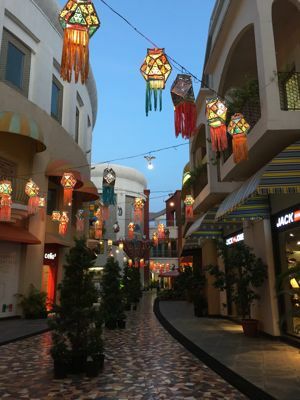 It was only a few days after Diwali so the area was still really busy. 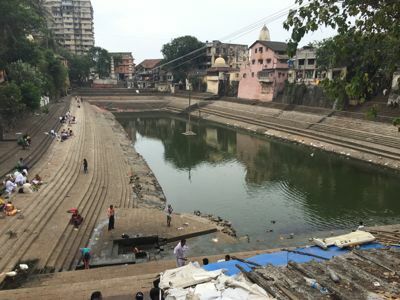 According to local legend the Hindu god Rama stopped at this spot while searching for his kidnapped wife Sita. He was overcome with fatigue and thirst, and asked his brother Lakshman to bring him some water. Lakshman shot an arrow into the ground, and water gushed forth creating the Banging Tank from a tributary of the Ganges (which flows over a thousand miles away). Mani Bhavan was Gandhi's headquarters in Mumbai for about 17 years - from 1917-1934. 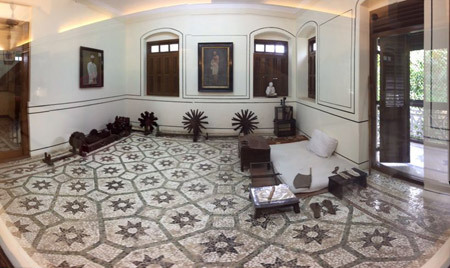 This was Gandhi's room at Mani Bhavan. 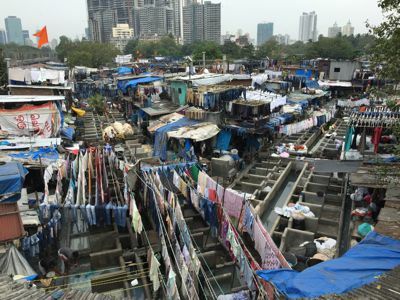 The "Dhobi" are the traditional laundryman (a hereditary occupation) who collect dirty linen from households around Mumbai. Almost two hundred dhobis & their families work together. Washing is completed by the men and taken inside to be ironed by the women. Clothes are returned to their owners a week later for a small fee. 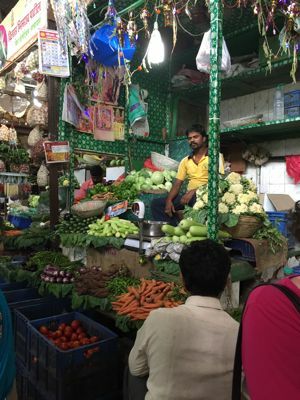 We toured Crawford Market and I saw many of the same stalls I'd seen a year earlier. Cathy bought a selection of spices (as I had done the year before - the spices are still in the cupboard!). 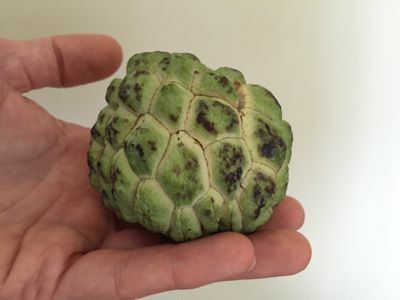 I really liked the custard apples I'd had on my last visit so bought a few to take away. A little messy to eat but they taste great. I wanted to have a closer look at the Victoria Terminus Station building. Strictly speaking you must have a ticket to enter but we took the chance! This was the ticket hall. That afternoon I decided it would be a good idea to go on another tour of the Dharavi slum. Mala arranged for us to meet Ganesh who was a friend of Sonil (the guy who gave me the tour the previous year). 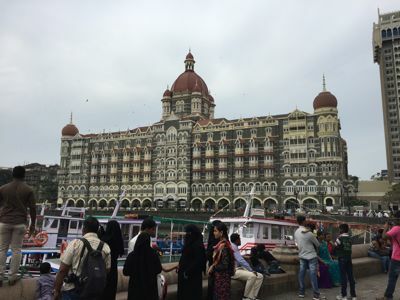 On 26 November 2008 Lashkar-e-Taiba, an Islamist terrorist group, launched a series of attacks on Mumbai, including at the Taj Mahal Palace hotel. Many hostages were taken during the attacks, and at least 167 people were killed. 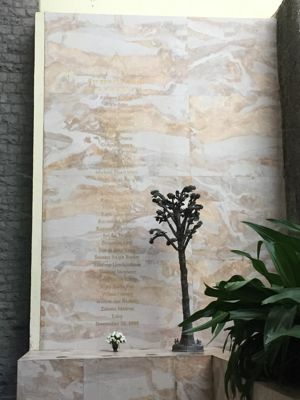 This was a memorial to those killed at the Taj Mahal Palace. 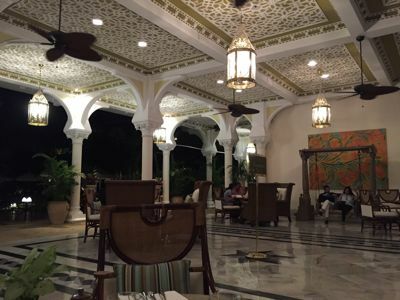 The pool area in the courtyard at the Taj Mahal Palace. The Taj runs free daily tours of the hotel - Cathy and I decided to tag along. That evening we retired to the terrace and had a couple of cocktails. I highly recommend the 'Rum along captain' (a rum version of the Caipirinha)! Monday 27 Cathy and I travelled to Pune where we stayed at the Westin. We spent the week working UK hours (approximately 12:30 to 22:30 local time) so I typically got up early for a session on the treadmill before breakfast, then travelled to the office where we had lunch & dinner in the canteen. 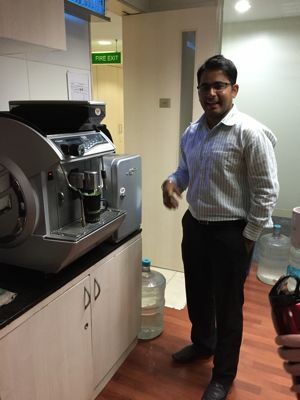 This was Swapnil on one of may many visits to the coffee area. Tuesday 28 We went to the Amanora Mall. Swapnil, Cathy. Mayuri and me enjoying coffee and cake at a cafe in the Amanora Mall. Unfortunately our visit was just a couple of weeks before Tuhina was due to re-join the team. Friday 31 We left the office a little early and took the team to BBQ Nation at the Amanora Mall. Saturday 1 November We were on a 13:45 flight from Mumbai to Heathrow which meant an early start from the Westin. Traffic can be a little unpredictable so we ended up arriving at the airport very early - nearly an hour before check-in was due to open. It was only as I walked into the departure hall that I remembered it had recently undergone a complete renovation. Fortuitously we have been given a free upgrade to first class! 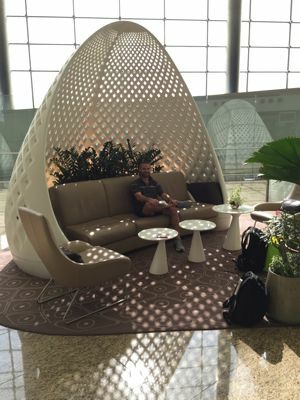 As we entered the terminal building I spotted a 'First class' seating area comprising about 3 'pods' like this one. Cathy and I took a seat and waited for check in to open. However, much to my surprise and delight, as we waited an attendant walked over and took our details/passports and before we knew it we had been checked in and our suitcase had been collected! All without the need to leave the comfort of the sofa! A small downside of the renovation was that BA has lost its lounge - instead we use a shared lounge - but the member of staff who looked after us was very attentive.